Many years ago, the Wimbledon surface was made out of a combination rye and fescue grass. It was lightning fast, it favored the big servers, but before long, it bored the crowds. “We want more rallies!” so the clamor went. They got their wish when fescue was abandoned because it could not withstand the fortnight-long wear and tear from the players’ shoes. The new, sturdy, all-rye grass surface was introduced sometime at the turn of the millennium. It slowed down the game and spelled doom for the great serve-and-volleyers. The emphasis shifted to longer rallies, played mostly from the baseline, and it is feared that before long, Wimbledon will fall to the relentless baseline-bashers. Just not yet. 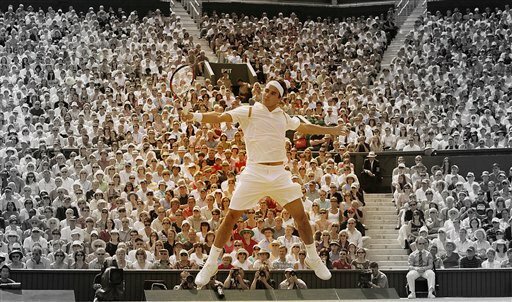 For this is still the Federer era and elegance thrives at Wimbledon one more year. With his unique brand of all-court wizardry and a mesmerizing repertoire of strokes, Federer has held off all comers for five years now. But, this year, it got a little too close for comfort. On Sunday, after two weeks of rain, and more rain, Roger Federer and Rafael Nadal provided a Wimbledon final for the ages – a five-set marathon of seesawing fortunes, vastly contrasting styles of play and the sort of edge-of-the-seat tennis that hasn’t been seen in a Grand Slam final for a long time. For all his power, Federer still plays the artistic, contemplative game of a bygone era – an era I know only from snatches of grainy video and black-and-white photographs, the prime of Laver and Rosewall. Nadal is the acme of the ultra-fast, modern, topspinning baseliner, and it made for a riveting five-set contest. Over the last three years, Federer and Nadal have defended their respective bastions of grass and clay, but the closeness of yesterday’s encounter suggests that the gap may be closing between the quiet, artistic throwback and his fist-pumping, effervescent challenger. It is perhaps not far-fetched to suggest that this year’s Wimbledon was slower than last year. It surely seemed that way when I was watching the matches. The slower it gets, the more it plays like the terre battue of Roland Garros, and the more it favors the unprecedented retrieving skills and physical force of Nadal versus the imaginative point construction and silken grace of Federer. So, as a self-proclaimed tennis aesthete, I celebrate every Federer Grand Slam victory with a tinge of sadness. This cannot last for long. For now, I thank my lucky stars and watch and store images or articles for nostalgia. In a few decades, when tennis is played on multi-colored courts by bionic men bashing the ball from one end to another with nuclear forehands and two-fisted backhands, I hope to relive the satisfaction of having watched the great Federer in his pomp, as one would a painter at his canvas or a dancer consumed by her art. A beautiful, trenchant analysis. I also watched the last match, and I do not think we will see its like again. Thanks, Tai and apologies for the delayed response. “Trenchant” is too kind a word in this context, I fear. I didn’t much intend to analyze the match, but to allow myself a little celebration after the considerable trauma of watching the seesaw tip this way and that for 4 hours 🙂 .